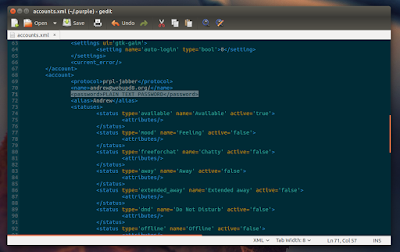 By default, Pidgin saves all your passwords in plain text (look under ~/.purple/accounts.xml). About four years ago there was a bug report that asked to encrypt the passwords, but the developers marked the bug as "wontfix". Update: you can read about the reasons behind this, here. Here's where Pidgin Gnome Keyring plugin comes in: this plugin will make Pidgin store your passwords in the system keyring. One note though: the plugin will not prevent other plugins from writing passwords in the accounts.xml file (I don't use any such plugins so I can't give you an example). Update: Despite the plugin being called "Pidgin GNOME Keyring", it was ported from gnome-keyring to libsecret in February 2015. Important note: to clear your old plain text passwords, click "Configure plugin" and check the "Clear plaintext passwords from memory" box. If you're not using Ubuntu, you can get Pidgin Gnome Keyring plugin via GitHub.